The sociable lapwing (Vanellus gregarius) belongs to the family of plovers, dotterels and lapwings, Charadriidae. The sociable lapwing species is distributed in India, Pakistan, central and southwest Asia, Arabian Peninsula and northeast Africa. This lapwing species is listed by IUCN as Critically Endangered. These lapwings are monotypic species. The sociable lapwing (Vanellus gregarius) is a medium-sized lapwing, measuring 25 to 30 cm in length and weighing 150 to 260 grams. The wingspan is 65 to 75 cm. 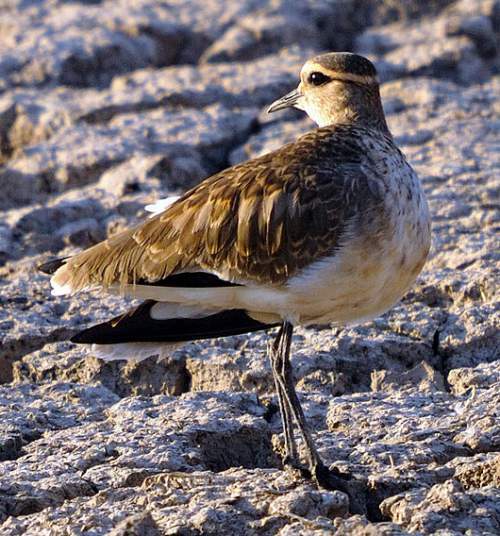 The adult sociable lapwing has olive brown (winter) or grayish (summer) upperparts with striking scalloped patterns. The crown is blackish brown. They have bold pale buff or whitish supercilium meeting on forehead and nape. The thin blackish brown lore extends up to nape in these lapwings. The throat, neck and breast are pale with dark brown streaking. The belly is pale chestnut. The undertail is whitish. The tail is white with black terminal band. Juvenile lapwing has brown back with slight scalloped pattern. The bill of these species is thin and black. The irises are blackish brown. The legs are long and black. The lapwing call is a harsh "kretsch..kretsch" and a rapid chattering sound. The sociable lapwing species are distributed in northwest India, southern Pakistan, Arabian Peninsula, northeast Africa and central Asia. The breeding populations of sociable lapwings are distributed in northern Kazakhstan and southern central Russia. Breeding and wintering populations have expatriated or have become extinct in several regions. 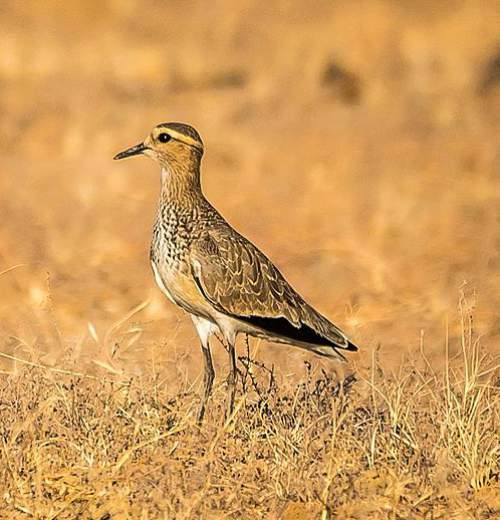 Wintering sociable lapwings are distributed in northwest India, southern Pakistan, Oman, United Arab Emirates, Saudi Arabia, Israel, Sudan, Eritrea and Ethiopia. In India, wintering lapwings are distributed in the states of Haryana, Uttar Pradesh, Rajasthan and Gujarat. Passage birds are observed in several stopover sites in between the breeding and wintering ranges. The Important Bird and Biodiversity Areas (IBA) of the sociable lapwing species in Azerbaijan is Lake Hajigabul. The IBA in Georgia is Chorokhi Delta. The IBA in Iran is Anzali Mordab complex. The IBA in Iraq are Samara Wetlands and Shuweicha Marsh. The IBA of these lapwing species in India are, Corbett Tiger Reserve, Valmiki Tiger Reserve and Saraiyaman Lake, Dihaila Jheel and wetlands, Flamingo City, Okhla Bird Sanctuary, Keoladeo National Park, Naliya Grassland and Kurra Jheel. Some of the IBA of the sociable lapwing species in Kazakhstan are, Aktubek, Zhusandala, Ulytau Mountains, Tounsor Hollow Lakes, Amangeldy, Shoshkaly Lake, Amankaragay Forest, Sarykopa Lake, Chingiztau Mountains, Emba River, Ertis Ormany and Irgiz-Turgay Lakes. These sociable lapwing species do not normally occur in forest. They normally occur in altitudes from 0 to 300 meters. The artificial ecosystems of these species include rural gardens, cultivated lands and ploughed and stubble fields. The natural ecosystems and habitats of these sociable lapwing species include dry wastelands, temperate deserts, burnt steppe, savannah, tropical and subtropical dry grasslands, temperate grasslands, steppes, brackish or alkaline lakes and wetlands. The diet of sociable lapwing consists mainly of insects. Insects, caterpillars, beetles, grasshoppers, cicadas, spiders, scorpions and crickets are their primary food. These lapwings also feed on seeds, grains, leaves and flowers. These species forage on the ground, picking insects and other small prey. Ploughed fields and grasslands are their favorite feeding grounds. The breeding season of the sociable lapwing species is from April to July in most of their breeding range. These birds are monogamous and breed in small colonies. The nesting sites of sociable lapwing are usually located near water on bare saline plains or on short vegetation. The nest is a scrape, which may be bare or lined with twigs, grass and pebbles. The lapwing clutch contains three to four pale buff, ovoid eggs with dark olive brown mottling. The breeding pair take turns to incubate the eggs. The chicks hatch out after 25 days. The parents brood the chicks. The chicks are precocial and are able feed themselves. These sociable lapwing species are partially migratory birds. The breeding populations in the northern and central Kazakhstan and south-central Russia disperse and migrate south during August and September. 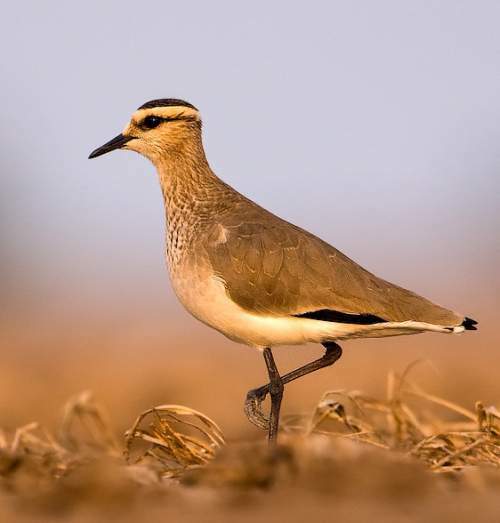 The wintering populations of sociable lapwings in Sudan, Pakistan, northwest India, Saudi Arabia, Oman and UAE make the return migration to the breeding grounds during March and April. Enroute there are several stopover sites. The global population size of the sociable lapwing (Vanellus gregarius) is estimated to number 16,000 to 17,000 individual birds. The overall population trend of the species is considered to be decreasing. Throughout its range, the lapwing species is reported to be very rare to locally uncommon. The generation length is 9 years. Its distribution size is about 1,670,000 sq.km. Habitat alteration and destruction, expanding agricultural and aquaculture activities and hunting are the main threats that are endangering the survival of this lapwing species. The sociable lapwing (Vanellus gregarius) has approach the thresholds for being Vulnerable to extinction under the range size criterion, under the population trend criterion and under the population size criterion. The IUCN (International Union for Conservation of Nature) has categorized and evaluated the lapwing species and has listed it as "Critically Endangered". The CITES (Convention on International Trade in Endangered Species of Wild Fauna and Flora) status is ‘Not Evaluated’ for sociable lapwing (Vanellus gregarius). The sociable lapwing (Vanellus gregarius) is often placed under the genus Chettusia. Current topic in Birds of India: Sociable lapwing - Vanellus gregarius.